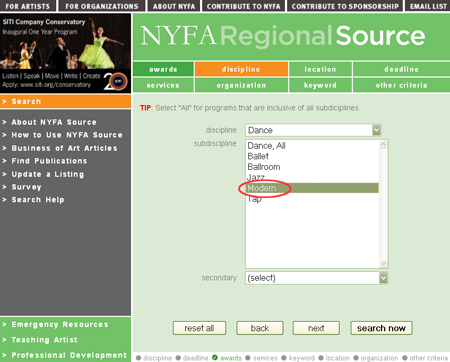 To learn more about using NYFA Source, see the video 'NYFA Source Online Tutorial' or review the 'Step-By-Step Guide' found below. NYFA Source Online Tutorial from NYFA on Vimeo. 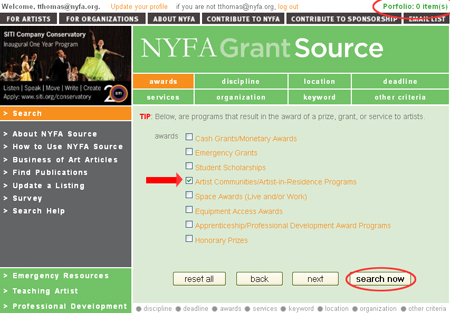 Toccarra Thomas, Program Associate for NYFA Source, walks you through how to search the database and shares tips on how to get the best results from your searches. 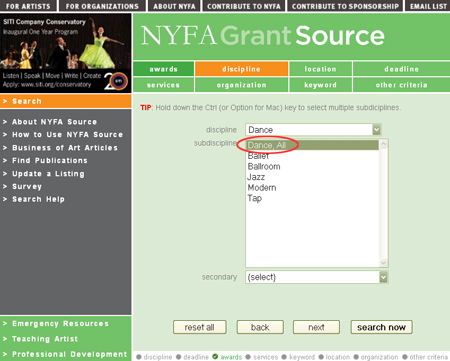 NYFA Source is the nation's most extensive database of awards, services and publications for artists of all disciplines including dance, folk, traditional, media, performance, intedisciplinary, visual, music, lriterature, theater, and arts management. 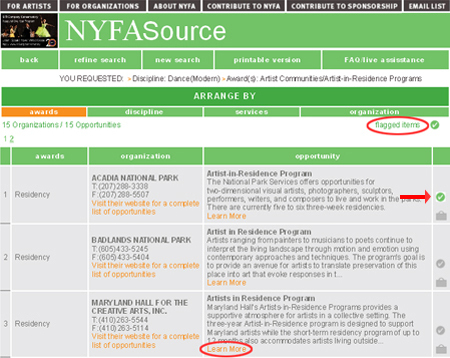 All programs listed in NYFA Source (nyfa.org/source) are classified as AWARDS, SERVICES, or PUBLICATIONS. [See Figure 1] If this is your first time using Source, we recommend structuring your search around one of these three categories. Competitive opportunities that result in a grant or prize, residency, career training, or public exposure for your work, such as juried art exhibitions or publication awards. Professional resources, including publications, which cover a range of topics, such as business or legal issues, career resources, or insurance information. This category also includes organizations that offer services to artists for free or for hire, such as fiscal sponsorship or membership. Publications geared toward individual artists, including books, periodicals, newsletters, and online publications. Note you can find publications by searching for SERVICES or by using the FIND PUBLICATIONS tab on the left sidebar. In the green boxes on the Source homepage, there are eight categories or search tabs you can use to begin a search or narrow down an existing one. As mentioned, if this is your first time using Source, start with either AWARDS or SERVICES and use the other search tabs to further define your criteria. Selecting more than one search criteria allows you to narrow your search down to a manageable set of results that most closely fit your needs. Lists of search criteria are available under each category tab. Only one search criteria from one or more of the main category tabs must be selected to initiate a search. Simply select a search criterion and select the search now button at the bottom right of the category window. If you want to select more than one search criteria, across categories, you can advance to the following category tab by selecting the next button or by clicking on a category tab. If this is your first time on Source, select no more than two or three search criteria (e.g. 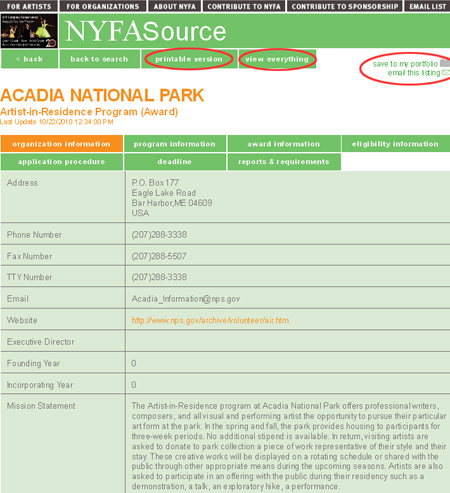 AWARDS: Artist Communities/Artist-in-Residence Programs > DISCIPLINE: Literature, Fiction). As you navigate through the list of programs, you have the ability to organize your search by flagging and/or saving programs of interest. In the last row of each listing, there are two icons. The circular icon with a check allows you to flag a program (or multiple programs). These programs can eventually be isolated into one list by selecting the flagged items link located at the top right-hand of the search result pages, under the Arrange By bar. The suitcase shaped icon allows you to save a program (or multiple programs) to your Portfolio, which can be isolated by selecting the Portfolio link at the top right-hand side of the NYFA Source page. Portfolio items can be deleted from your account, by selecting the suitcase icon under the keep/delete section of the Portfolio page. Start a search with no more than two to three search criteria selected. Narrow your search by selecting the refine search tab at the top of the results page. This allows you to modify the originally selected criteria, without having to start a new search. When running multiple searches, select the reset all button between each search query. Reset all clears the selected categories and search criteria from the previous search. If this is not done, the selected categories and search criteria from the previous search will be added on to the new search and will distort the records of programs returned. When running a search, using the DISCIPLINE category, you must select a subdiscipline and run two different variations of the query to ensure that you see all of the opportunities available. When running a search, using the LOCATION/GEOGRAPHIC ELEGIBILITY category, you can simultaneously search for programs /grants available to those living in specific states, as well as programs/grants available to international applicants. When running a search, using the DEADLINE category, please note that any program/grant with a rolling deadline or unspecified deadline will NOT be included in your search. We recommend performing two separate searches (one with and one without designated deadlines). Offers a listing of publications geared specifically to individual artists, including books, periodicals, newsletters and online publications. Articles and interviews pertaining to the business of art, including topics on fundraising, marketing, exhibiting and performing, as well as interviews with artists and art professionals. Resources for artists and art professionals who are experiencing hardship, due to natural disasters, illness or financial trouble. Listings include discipline-specific emergency cash grants and resources, as well as public assistance information. Grants, services, and publications specifically for teaching artists on the local, regional, state and national level. 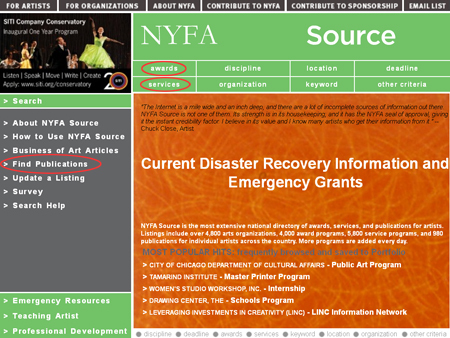 NYFA Source features over 10,000 listings of AWARDS, SERVICES, and PUBLICATIONS (with more added everyday). Registration allows you to remain organized, while searching through NYFA Source’s vast database, by enabling you to save selected listings in your Portfolio. Items saved in your Portfolio remain accessible to you each time you login. Even if you choose to not register, you may still search the database. However, you will not be able to save searches and you will lose your data after you have closed your browser. Should you have any questions about using Source, email [email protected] or call (800) 232-2789 (3p – 5p EST Monday-Friday excluding Holidays).